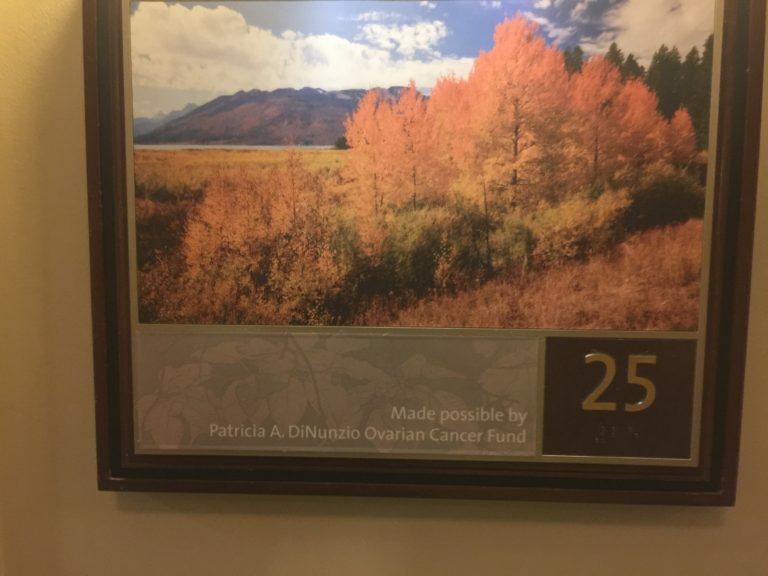 Recently, the Patricia A. DiNunzio Ovarian Cancer Fund enabled significant upgrades for Ohio State University’s JamesCare at Mill Run, including a remodeled break room that offers a peaceful respite for staff, while providing easier access to the patient care area. The fund also purchased 32-inch flat screen televisions and movies for each chemotherapy chair. A common side effect to chemotherapy is feeling cold due to a reduced number of red blood cells (anemia) carrying oxygen to cell tissues. With the comfort and the needs of the patient in mind, the Patricia A. DiNunzio Fund purchased blanket warmers for each chemotherapy chair. The Fund also connects patients to holistic treatments known to reduce stress and to increase relaxation such as Reiki and Urban Zen. 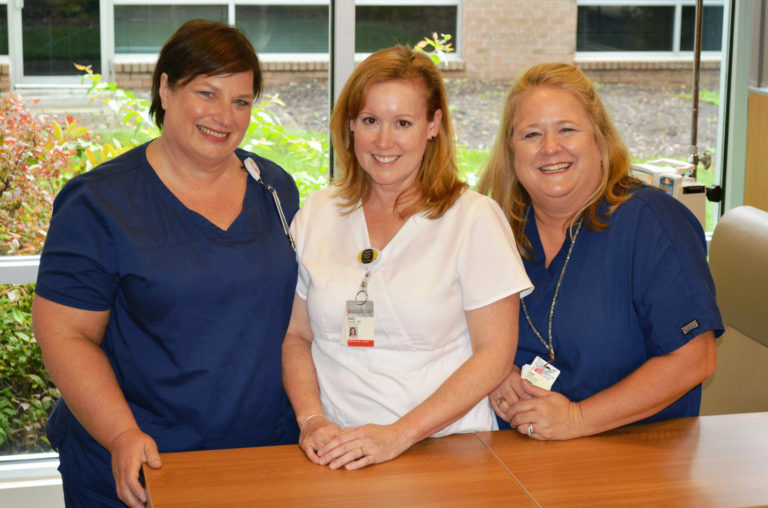 Two Patricia A. DiNunzio Memorial Scholarships are awarded annually to an outstanding OSU James Hospital nursing staff member and a compassionate OhioHealth home care staff member. The ideal candidate cares for cancer patients and is dedicated to cancer advocacy and family-centered principles. Recipients are selected by the DiNunzio Family and representatives from OSU and OhioHealth nursing leadership. We help fund research by Ohio State University’s Jeffrey Fowler, MD. Dr. Fowler has studied provider “burnout” in healthcare workers in the fields of obstetrical and gynecological cancers over the past 15 years. In 2002, Dr. Fowler and his colleagues observed a moderate-high to high level of burnout in 42.9% of the chairs of academic departments of obstetrics and gynecology. Major stressors noted by participants are budget deficits and loss of key faculty. In 2018, the Patricia A. DiNunzio Ovarian Cancer Fund sponsored a mile marker at the Memory Mile benefiting OhioHealth’s hospice program. Anamarie DiNunzio Rayburn also serves on the OhioHealth Developmental Board as a trustee. End-of-life care provides a sense of comfort for patients and eases the struggles faced by their loved ones. 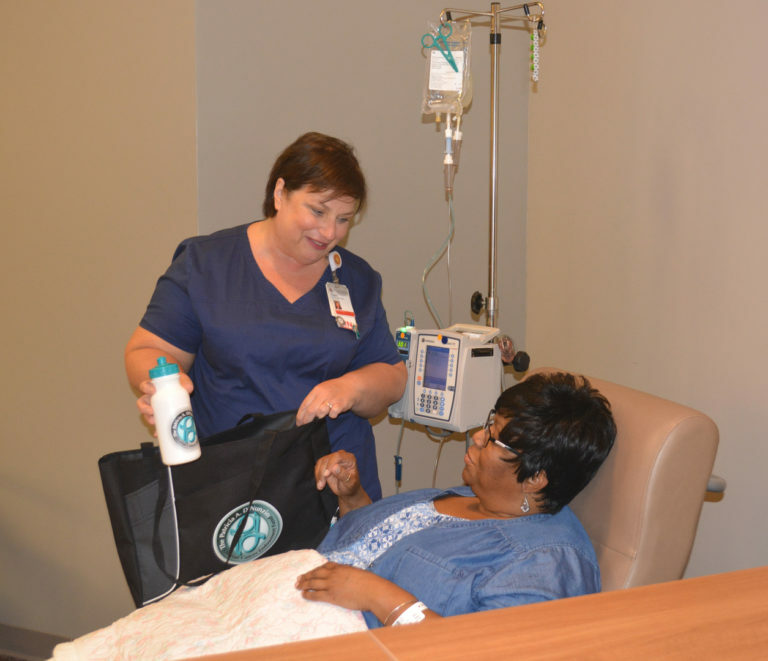 We continue Pat’s tradition of providing comfort bags to new patients containing must-have items for easing the effects of the treatments. Each patient at JamesCare Mill Run receives a black tote filled with eye shades, lip balm, notebook and pen, patient education pamphlets, hand lotion, hand gel and a magnet. In the five years between her ovarian cancer diagnosis and her passing in June 2014, Pat DiNunzio spend an immense amount of time at Ohio State’s JamesCare Gynecologic Oncology office at Mill Run. In 2015, the Patricia A. DiNunzio Memorial Scholarship program was established for nurses to receive money for advance nursing degrees. Here are our current and past awardees. We are very proud of them!